With its various parts and configurations, MSR's Hyperflow Microfilter weighs between roughly 7.6 and 9.9 ounces total. Go with the higher number—leaving parts at home (such as the Nalgene bottle adapter or even the carrying sack) is not recommended. That makes the Hyperflow roughly two and a half ounces lighter than Katadyn's Hiker series—a difference which may or may not be fair compensation for the Hyperflow's added complexity. Without question, the MSR Hyperflow comes with a number of issues that make the unit awkward if not downright cranky to deal with. 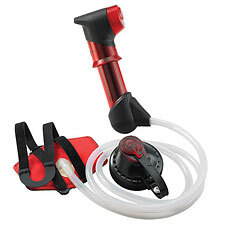 On the positive side, the Hyperflow is a sturdy performer, capable of filtering up to three liters of water per minute. I liked the MSR Hyperflow's sleek, futuristic design, as well as its compact size and its ability to quickly pump out clean water. Unlike the Katadyn Hiker, the Hyperflow clears itself almost completely when you're done pumping, so you don't carry around extra water weight in the filter. As with the Hiker, the Hyperflow does not kill viruses, and should not be expected to safely treat water from heavily polluted areas/sources (ie, urban or international). The MSR Hyperflow must be held horizontally when pumping, and does take a relatively high amount of force to push out clean water. This requires the pumper (you!) to provide opposing force when pumping, which can turn a lengthy water-treating session into a bit of a workout. Compounding the pumping challenge is the requirement that you hold the Hyperflow unit immediately adjacent to your water bottle, which does tend to make pumping a rather delicate balancing act at times. Persons with less-than-formidable upper body strength or just those who are on the tired side of the day will notice this right away. If you are using a wide-mouth bottle, the Hyperflow ships with a wide-mouth adapter, which is essentially mandatory because of its critical role in the Hyperflow's need for regular "backflushing". MSR recommends you backflush the filter for every 8 liters of water treated, which in practice is going to translate to once per day of use. While backflushing does restore a reported 80-90% of filter performance, it can be a bit tricky. I rehearsed the backflush process at home with directions in hand, figuring I'd see if I could remember how to do it in the field. I couldn't. In fact, even with the directions, it still took me several tries and repeated glances at the instructions to get it right. Given that the backflush process requires you to disassemble the Hyperflow (and keep several small parts from getting lost or contaminated), I can't say I find this a viable in-the-field procedure for the majority of users. This means you'll probably choose to forgo backflushing, as I did, and put up with gradually diminished flow and strenuous pumping. Which brings us back to that magic number: 2.5 ounces. Finishing up a week of filtering water with the MSR Hyperflow, I pondered those two and a half ounces quite a bit. Were they worth the obvious annoyances of the Hyperflow? Maybe—especially for short, one or two day trips. As you grow more familiar with it, and learn to deal with the quirks, the Hyperflow does perform like a champ. That said, if it wasn't for those 2.5 ounces, I'd happily use my Katadyn and not look back.